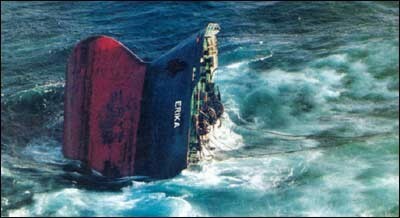 On 12 December 1999, in severe weather, the Maltese registered tanker Erika broke in two 70 kilometers from the coast of Brittany, France, whilst carrying approximately 30 000 tons of heavy fuel oil. Some 19 800 tons were spilled. The sunken bow section contained 6 400 tons of cargo and the stern a further 4 700 tons. The bow section sank within 24 hours. The stern section sank on December 13 while under tow. This single oil spill was equal to the total amount of oil spilled worldwide in 1998. The economic consequences of the incident have been felt across the region, a drop in the income from tourism, loss of income from fishing and, a more recent development, a ban on the trade of sea products including oysters and crabs, have added to the discomfort of local populations. Corrosion problems had been apparent on the Erika since at least 1994, with details readily available to port state control authorities and potential charterers, US Coast Guard records show. In addition, there were numerous deficiencies in her firefighting and inert gas systems, pointing to a potential explosion risk on the tanker. Lloyd's List reported that severe corrosion had been discovered by class just weeks before the incident. However, no immediate remedial action had been taken. These revelations added to the growing concern in France that the subsequent spill of heavy crude oil would not have occurred had notice been taken of obvious and ample signals that there were problems with the 37,283 dwt ship. According to publicly available US Coast Guard records obtained by Lloyd's List, Erika had been inspected in a variety of US ports on several occasions since 1994. Her certificate of financial responsibility, a document legally required by tankers wishing to trade in US waters, had expired in March 1999, and had not been renewed as of November 30. In an inspection in Portland in July 1994, holes were discovered in the main deck coaming, indicating that signs of corrosion were already in place more than five years ago. It was also found that there were holes in both the portside and starboard inert gas system risers, which are critical items of safety equipment. Malfunctions would tend to increase vulnerability to explosions. Firefighting equipment was also in poor shape. Many of Erika's problems had simply been patched up, rather than properly repaired. In an inspection in 1997 in New Orleans, the US Coast Guard ordered that no cargo operations requiring the use of inert gas systems should be conducted until permanent repairs had been effected. Pinhole leaks remained in the firemain, contrary to Safety of Life at Sea convention regulations. There was yet more evidence of corrosion, with the ship's watertight doors not sealing properly and wasting on the door coamings. Erika switched from Bureau Veritas to Registro Italiano Navale in 1998, which authorized her to continue operations despite the French society's order for a full inspection.